I really wanted to go outside the other evening. Cool and crisp fall air was upon us. 3 year old Ethan was less than interested, so I suggested we decorate for Halloween. Suddenly, going outside was a cause he could get behind. 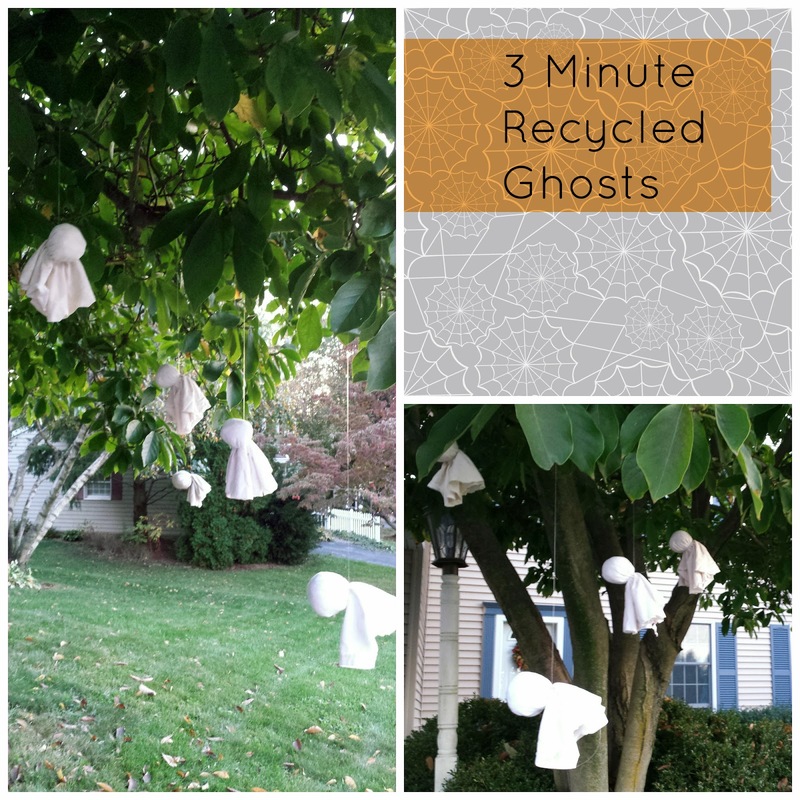 I really didn't have much, and I hadn't planned ahead (silly Mommy)...and so I decided I'd make ghosts while Ethan played with the materials we'd quick whip up some ghosts. I headed to the basement (where the treasures are) and got some old white t-shirts that Daddy was saving for when he works on the car. I also grabbed some scissors, plastic grocery bags, and fishing line. I balled up 1-2 bags and wrapped the t-shirt around it. 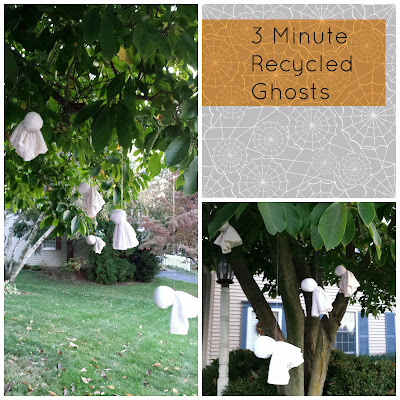 I'd hold the shirt tightly around the plastic bag ball, and then rather haphazardly, I'd cut the "tail" of the ghost. Tie with some fishing line and ta-da! I said each ghost took about 3 minutes, but after I got rolling, it was probably even faster than that. Ethan directed where to hang them in the tree, and we were done! If I were to do it differently (aka, didn't have a preschooler chomping at the bit), I may have threaded the fishing line though the top of the head to hang them, but I like to think when they're leaning, it's like they are really flying! Ooooooo! Weather pending, I may add some spider web to the base of the tree for Trick or Treat night. Either way, they really do look quite spooky out there! Happy Halloween!